Archeological Site of Zeugma is part of the Tentative list of Turkey in order to qualify for inclusion in the World Heritage List. Before I started planning our 2015 trip to Turkey I hadn’t knowingly heard of the T List site of Zeugma but it emerged first when, in order to inform my route decisions, I looked at some advertised “group journeys” to the area and they all included the Zeugma Mosaic Museum in Gaziantep. My immediate reaction was “Oh yes – another “filler” excursion to a minor regional museum to pad out the day!” It soon became clear, however, that this museum was far more than that. But what about the actual site of Zeugma itself? It is situated around 55kms east of the sprawling city of Gaziantep (Pop 1.5 mill) – to find it on a map you may need to search for its current Turkish name of Belkis and this name was used prominently on the signs off the Sanliurfa – Gaziantep motorway. We hadn’t originally intended bothering with it, but its recent history and its links to the Mosaic museum which we had decided to visit, convinced us that we should divert off the highway and see it – it took us a bit over an hour. The “recent” significance of the site is that, in the year 2000, a large part of it became submerged under the waters of the nearby Birecik Dam on the Euphrates. Significant excavations had, apparently, only started in the late 1980s, initially partly in response to pillaging by antiquity hunters (which had, however, been ongoing since the 19th C!). These quickly uncovered a series of magnificent Roman mosaics (and unfortunately failed to prevent some further thefts –some of which have been returned from as far away as Houston!). The construction of the dam which commenced in 1996, with the impending flooding of much of the site, gave increased impetus to the excavations as a “rescue operation”. Pompeii. The site also has connections with the Kingdom of Commagene, having been given to its king, Antiochus I, by the Romans in 64BC in return for “loyal assistance”. He died in 38BC and I have read that Zeugma’s wealth helped to fund the construction of his tomb on Nemrut Dag situated around 200kms away! The site is pleasantly situated in countryside next to the lake. There is a small car park and a police hut but entry is free and there is no visitor centre. 2 people were just departing as we arrived and another group of 8 arrived as we departed – so we had the site to ourselves! From what I had read previously, I hadn’t really expected to see much at all in the way of remains but in fact there is a large structure covering a number of excavated buildings on a hillside above the lake. This was opened in 2010 and covers the Houses of Dionysius and Danae. It is enormous and must have been quite an undertaking – unfortunately there was evidence that it was already leaking quite badly in places and some of the walls/floors had been covered by tarpaulins. The decision seems to have been made to leave the mosaics discovered within these 2 houses “in situ” – that of Dionysius and Dyctis is apparently considered particularly fine and, indeed, if one hadn’t later seen what was in the Zeugma museum, one might have been quite impressed! Footpaths in the site lead to a number of other locations – including lakeside maps showing where the inundated buildings are situated. Under the clear water a few walls disappearing into the depths could be made out! The map showed a fair number of other “above water” locations beyond the covered area but those we saw were more like building sites and we decided that we had adequately seen what was “on show”! For the moment, at least, the museum is dedicated solely to Mosaics and it appears that other artefacts found at Zeugma are still in the old Archaeological museum which, unfortunately, we didn’t have time to visit. I particularly regret missing one aspect – as well as its “claim to fame” for mosaics, Zeugma has also yielded 140000 “Bullae” or clay seals (as per “Papal Bull”) – the world’s largest collection. These were discovered in the “Archive Room” – a part of Zeugma we had missed out (it was close to the Police hut too!) – and were used in the administration of trade, testifying yet further to Zeugma’s importance. Zeugma was placed on Turkey’s T List as recently as 2012 (Interestingly it had not been on the original, and very long, T List of 1984, much of which later got removed - presumably since it had hardly been excavated at that time). So, what are its chances? Well it does of course have a major negative – the fact that it represents a site, at least partly, destroyed by the building of a dam. Can UNESCO be seen to be “rewarding” such an action? On the other hand it also represents a major international effort to save and protect what are perhaps the most important aspects of the site. Which raises another issue – could the mosaics removed to a museum be regarded as being a part of its OUV? “Movable” objects are not allowed but these mosaics were hardly intended to be “movable” any more than Abu Simbel or Philae were!! To what extent can a site be of OUV for what has been found there and removed? The T List description refers to the mosaics both on site and in the museum, but doesn’t make clear whether any use of these in the site’s case for inscription would be limited to those (very few) “in situ”. There seems little doubt that Zeugma has provided a vast amount of “knowledge” as well as physical evidence about the Roman frontier but whether the claim that it “is of immense historical significance for understanding the ancient integration of Hellenistic and Semitic cultural spheres and the birth of syncretistic hybrid cultures in the region” makes it special enough I know not!. I have had some problems choosing a single photo to represent Zeugma. I could show the building covering the houses, or an internal view of them, or a general view of the site and the dam. 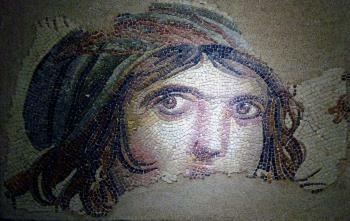 However, I felt I had to choose the “icon” of Zeugma which adorns all its publicity - the museum mosaic showing the rather fancifully named “Gypsy Girl” – so “special” that she gets a room all to herself, subdued lighting, music and a special guard! But she does show the quality of what has been found and hopefully may provide a reason to research further on the Web, where photos of other mosaics and the site can easily be found, as well as a reason to visit the museum and, possibly, if you have time and transport, the site from where they came. My hgusband and I were at this site just as the village was being inundated with the rising water of the Ataturk Damn The archaeologists were desperate to remove as much as possible to the local museum befor the water overcame the latest portion of the dig. We were able to see beautiful mosaics and frescos in place , not in a museum. So much was lost but people do need water. Was the damn a political act or a humanitarian act?